The roots of confectionery production of Janoš Company reach deep into the beginning of the last century, when Mrs. Marie Janošová, a skilled cook, started to make confectionery, wedding cakes, desserts, cakes and occasionally gingerbreads, which all were sold in her shop. Her products were of extraordinary quality and always precisely decorated and very tasty. Her son Josef, inspirated by her mastery, continued in her footsteps. In 1941, he started his education in Kroměříž, Czech Republic. After he finished his confectionery craft studies, he worked in lot of Czech cities like Prostějov, Přerov or Staré Město pod Sněžníkem to master his skills. After he finished his mandatory military service, he worked for the private bakery of Jan Langr, on Pernerova Street in Pardubice. At the time when Josef joined the bakery, gingerbread was only in marginal production. Gingerbread slices were baked occasionally and decorated gingerbread was baked only for St. Nicolas Day, Christmas, Easter, festivals and for official visits. Josef Janoš worked there for three years as a journeyman, then as a master baker. When Mr. Langr could not longer continue his work due to health reasons, Josef assumed his role. 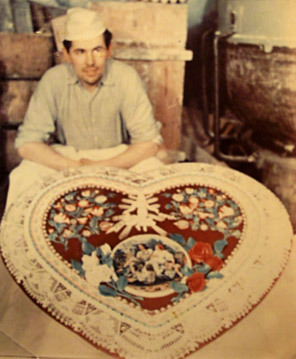 In 1958, Josef was asked by the Association of Corporations, to bake a giant gingerbread heart for a world exposition in Brussels. He worked on the heart for several days and nights, but the result was well worth it. The gingerbread was very well regarded and even the Belgian Queen was interested in it. For some time, he was the confectionery produce master at Pardubice's railway station. In 1987, with the approval from the City National Committee, he and his wife started a small enterprise of their own. Their products were immediately popular. In 1991, their son Pavel Janoš decided to continue the family tradition. Originally a small, familyrun company, the demand for its gingerbread grew due to ever growing demanding customer base. More and more custom orders arrived and the high quality of their goods required long hours. Despite the extra busy schedule and lack of spare time, Pavel accepted an invitation to a state-wide competition of confectionery and bakery products in 1998 Brno. In a though competition of 25 other bakers from all over the Czech Republic, his products ranked as the best, leaving no doubt as to who the true master of gingerbread baking was. He earned a a well-deserved title of CONFECTIONARY & GINGERBREAD BAKER OF THE YEAR. This competition was held rightly, and the next time it took place, in 2005, Pavel won the title again. He ranked four times as the best in his cetegory during Gastro in Pardubice competition. In the last one, he become the absolute winner and won a Nestle Cup. During the annual traditional Gingerbread Celebration Days in Pardubice, Janoš Bakery employees won the title of Gingerbread Queen several times - Jana Sirůčková won in 2001, Marie Jurenková in 2002, Pavel's mother Věra Janošová in 2004, Zdena Jančíková in 2006 and Jana Sirůčková again in 2007. In 2007, the winning product was suggested and designed by Pavel Janoš - beautifully decorated church of St. Bartoloměj in Pardubice placed on in gingerbread heart. Pavel Janoš was vigorous in continuing the the tradition and he created many new, never before seen shapes. He enriched his father's skilled work with his artistic talents. He created new, modern shapes and bravel several non-traditional orders. Mr. Josef Janoš obtained a medal "Czech Confectioner" and a diploma "Master Confectioner - Gingerbread Baker" for his lifetime quality efforts, presentation and contribution to his craft in 1998 from the hands of Drahoš Hvězda, chairman of Confectioners of the Czech Republic Association. During his jubilee birthday celebration in 2001, Mr. Josef Janoš was awarded the memorial medal of Bohumil Hlavsa by the Confectioners Association, with the mayor of Pardubice present. On March 6, 2006, Josef Janoš was awarded the Order of St. Ambrož in the King's Hall of Pardubice Castle by the Confectioners Association, together with the Ministry for Local Development. On November 25, 2006, Pavel Janoš won a competition of the Best Entrepreneur in Pardubice County by a large margin. Pavel played an important role in the opening of the Gingerbread Museum below the Kunětická hora castle in 2005.